Now while we can all mourn her faction and race choice, since if you have to be a dirty hordie, a Goblin priest is the only way to go, it allows me to revist the comparison of the two specs from a damage and leveling perspective. One is straight laced and by the book, the other is a loose cannon and always in trouble with the Bishop. Together they are a bad guy's worst nightmare. Let’s stack these two specs against each other and see in the 30s which is better for leveling. To start off here is a link to each spec so you can see what I chose. My focus was towards PVE leveling not min maxing for PVP or running instances as a sole means of experience. Discipline relies as Smite as a main nuke with the goal to maintain a full stack of Evangelism and use Penance or Holy Fire when off cooldown. Shadow relies on applying Shadow Word Pain and Devouring Plague and using Mind Flay as filler and Mind Blast when it strikes my fancy. It is important to note that Shadow Priests cannot get Vampiric Embrace until level 39 at the earliest, while Discipline can start putting points into improved shields in the first tier and can have smite healing themselves with Atonement if they are close to the target by level 29. It isn’t to say that Shadow is a glass cannon, they can always shield themselves in Shadowform and if things get real bad they can always throw a big heal out. But based on my experience Discipline feels more durable at this point since it is designed to be a shield happy smite for healing spec. For this I was using mobs in Hinterlands while questing. I’d chain kill five or six mobs with Recount resetting after each fight. I’d then switch to the other spec and repeat the multiple mob kill test. I did this for a while. The thing that surprised me was that Discipline did just as well as Shadow. Shadow did better on slightly longer fights while Discipline did better on short kills. Discipline was more prone to higher burst damage. If you get a few crits the damage is really nice. This is largely due to Evangelism. 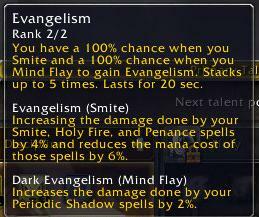 Evangelism is the keystone of a Smite DPS build. Now when you have five stacks of this you are hitting for 20% on all your key DPS spells, and you are paying less mana for it. This is insanely powerful and something Discipline priests should have talented for by 21. So it seems that on the early half of the leveling curve Discipline has no significant disadvantage to Shadow for DPS output. I have to think though that as priests get higher in level the DPS output has to cross in favor of Shadow. But as of level 35 it is still anyone’s game. One other thing to note is that this is from the perspective of just questing. There might be a scenario where the longer fights in instances against bosses might favor shadow significantly over discipline, but since most likely a leveling priest is killing 10 X for NPC Y the fights don’t seem to last long enough for it to pan out like that. When looking at how to effectively quest you want a spec that doesn’t require you to stop and drink every third fight. Here Discipline comes out ahead again. First the mana costs of Shadow’s DoTs are pretty high compared to Smite and Penance. You will not notice your mana bar dipping very fast at all. While Shadow, I found that I was stopping to drink way more and that time spent drinking is time you aren’t getting stuff done. Now this will probably be mitigated when Shadow can get Vampiric Touch at 49, but that is a long way off, and there are a lot of things to kill between now and then. The prospect of chain pulling is not daunting at all in Discipline, while Shadow will need to be a bit more measured. 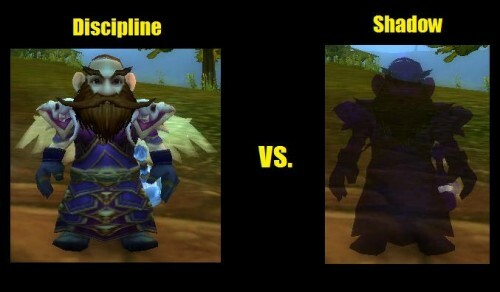 So at 35 I find that Discipline is a better spec for questing than shadow. As I level I will periodically check back and see where it crosses over for Shadow and try to figure out why. All I know is that if Shadow never pulls away and is a clear dominant DPS spec that endgame will see some Discipline DPS due to the utility of having a DPSer who can heal without gimping themselves in a raid. I am just finishing up leveling a new priest (83 now) and I came to the same conclusion at low levels and higher up. I leveled Discipline from 10-83 with a few respecs to shadow to see if I was missing out on anything. Shadow just had to much downtime for me and I’ve never liked the play style. Killing mobs with 60k hp can be a little tedious with smite spam atm, especially if you are used to a real dps class, but my survivability is absurd and I can’t run out of mana, unlike shadow. Coming back to this, as i have just started a disc priest. What was your base rotation when leveling? I’m having a hard time deciding whether to use smite or mind flay more often. If you are scanning this post still might you give some insights please? Typically I go with the priority of Penance>Holy Fire>Smite. I will probably also open with a few smites to get a stack of evangelism going which increases Penance and Holy Fire damage by 20% (5 stacks) and reduces mana cost by 20% (5 Stacks). I pretty much ignore Shadow Word Pain, Devouring Plague and Mind Blast.